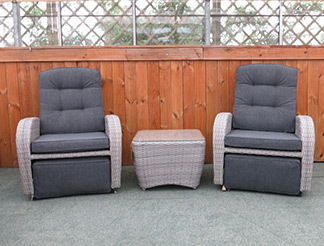 A reclining garden chair can give you the perfect place to relax in your back garden, ideal for a summer afternoon. 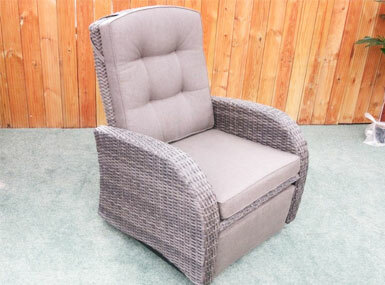 We have reclining rattan chairs, including a range of rocking chairs, with cushions included, as well as reclining sofas, benches, and loungers for you to choose from. You can shop the full range of reclining garden chairs online here. The luxury of a rocking chair, with the comfort of thick cushions and a reclining back. This luxurious chair set comes with 2 chairs and a small glass topped side table, perfect for enjoying a relaxing afternoon with a friend or family member. You can adjust the recline of the chair to the perfect angle, and the rocking motion is gentle and not overwhelming. Choose from 3 brilliant colours, stone grey, light grey, and brown coloured rattan is available to purchase online, with UK home delivery. If you just want one chair for your garden, then this rocking reclining chair could be perfect for you. The rattan is all weather, and is UV stabilized to avoid fading, with a strong aluminium frame to prevent any rust from occurring. You can by this rattan garden chair online today, in stone grey, multi brown, or light grey rattan, with matching cushions included. There a a few main points that make this furniture simply brilliant for outdoor use. The rattan is UV stabilized, which ensures no fading or degrading from the sun light. Aluminium frames to this furniture prevent it from rusting, allowing it to remain solid while left in the snow and ice. This combines to create a weatherproof furniture set that you and your family will enjoy for years to come, perfect for the great British weather!